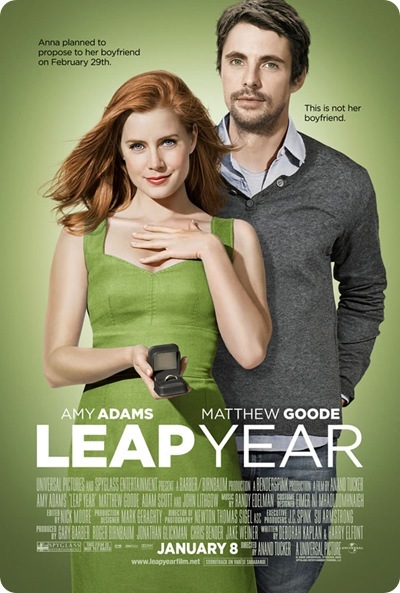 Not all Romantic Comedies are Created Equal… — Sweetchic Events, Inc.
As a romantic comedy enthusiast, I was excited to see Leap Year. It had all the elements of a decent romantic comedy: adorable heroine, scruffy but handsome leading man, beautiful scenery… but the script was just plain awful. Cheesy, predictable, cliché. Luckily I used free movie passes, otherwise I would have asked for my money back, haha, kidding! The terribleness of this movie led me to ponder my Top 10 favorite romantic comedies. These are the movies I can’t pass up if I see them playing on cable TV. I remember when this first came out, I went to see it in the theaters at least 3 times! I think this movie was panned by a lot of people, but it always puts a big, fat grin on my face. And it doesn’t hurt that Jude Law is sooo dreamy! Classic Hugh Grant romantic comedy. He is so self-deprecating, with a dorky charm. And how can you not love Julia Roberts somewhat playing a parody of herself as a mega-successful actress? I can’t count the number of times I have seen this movie. On a trip to Taiwan in 2008, this movie was on continuous repeat on HBO, one of the very few English channels. So we watched it over and over… and I laughed every time!! Hugh Grant is so deadpan, and so hysterical. My first introduction to the existence of a such thing as a “Wedding Planner”. Of course it’s only natural that a few of the movies on my list are wedding-related! in my book. I love them both! But You’ve Got Mail always makes me wax nostalgic for the days of AOL, haha. The only downside of this movie is that Gerard Butler gets SO LITTLE screen time… He is one hunky Scotsman! As much as I love a good comedy, I also love a good tearjerker. And this one made me cry… A LOT! We have to watch Love Actually every year come December; it’s the perfect feel-good, holiday film! My two favorite storylines are probably a) the one with Colin Firth as the writer and his non-English speaking housekeeper, and b) Hugh Grant as the Prime Minister and his (short-lived) assistant, Martine McCutcheon. Hrmm, this is the 3rd movie on my list with Hugh Grant… I didn’t realize I liked him so much! ).And the best makeover/shopping scene ever! A few more that would have made the list if I made it a Top 15: Serendipity, About a Boy, Shall We Dance, My Best Friend's Wedding and the Wedding Planner. What romantic comedies are on your list? !